General objective of this lecture is to presentation on Distributed Databases. 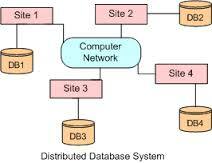 Distributed databases is really a database in which storage devices aren’t all attached into a common processing unit for example the CPU, controlled by the distributed database managing system. It can be stored in multiple computers, located in the same physical area. Unlike parallel programs, in which the particular processors are tightly coupled and constitute just one database system, a distributed database system contains loosely-coupled sites that will share no real components. This lecture briefly describe: Heterogeneous and Homogeneous Databases, Distributed Transactions, Concurrency Control in Distributed Databases, Distributed Query Processing, Distributed Data Storage, Commit Protocols, Heterogeneous Distributed Databases etc.